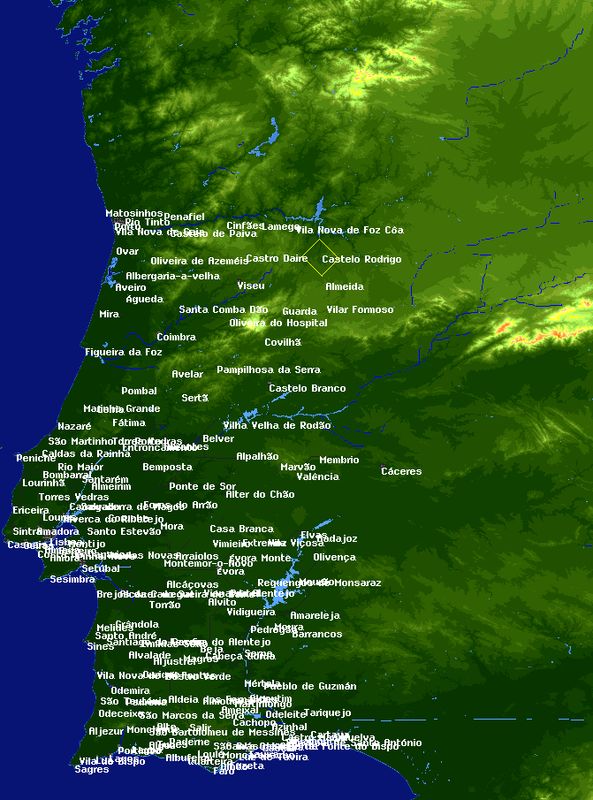 I've decided to create a map of the Iberian peninsula with cities. At the moment only south Portugal (below Tagus river) is done (and some spanish cities like Caceres or Huelva). I'll post the save so you can check. After it is done you can play in all Iberia and a bit of Morocco from 1750 in Simutrans Extended. I plan to add after it's done "starting dates", like 1848 (first railway in spain) or 1857 (first railway in Portugal) or even 2018! It is not historically accurate, since the city of Santo André (near Sines) was only founded in the 20th Century. Attention: I did this in Simutrans-Extended, so I don't know if works on the normal simutrans. What pakset does this require? cities of present population greater than 40000. It's for pak128. I'll make available all the materials I'll use if things work. Did you obtain all those coordinates manually? ...also, is there a way I could amend the script so that it actually draws a river instead of placing markers where the river should go? No. In fact, I get them from OpenStreetMap data as it's shown in the link in one of my messages. I've built some scripts to help in the process. ..also, is there a way I could amend the script so that it actually draws a river instead of placing markers where the river should go? Regarding the error, I think it could be related to the version of ST used. I used the nightlies. I'm not an expert on the scripting aspect of ST, so I can't tell you for sure. I don't think that, at least with the scripting part of ST, it is possible to build the rivers automatically. Reason is that the functions that modifies the map are very limited. We would need at least, capability to do earthworks and possibility to build ways (rivers). I don't know how to do that. But, again, I'm not an expert on this. Maybe, Dwachs knows the correct answers here. It would be interesting to use a script to place the cities in the correct coordinates and with the correct name. 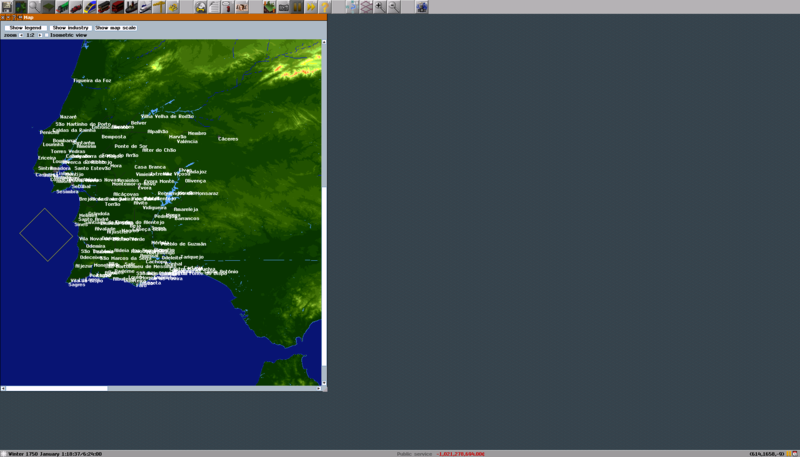 I have some experience doing script for simutrans, but I do not know much about the tools used to create maps. Can you get the coordinates of cities, as they do with rivers?. In what form should be the coordinates? I think there are different forms to write them. How do I coordinate a river? Isidoro is the one who knows how to do it, I've never created maps, just sctipt. No. In fact, I get them from OpenStreetMap data as it's shown in the link in one of my messages. I've built some scripts to help in the process. Regarding the error, I think it could be related to the version of ST used. I used the nightlies. I'm not an expert on the scripting aspect of ST, so I can't tell you for sure. I don't think that, at least with the scripting part of ST, it is possible to build the rivers automatically. Reason is that the functions that modifies the map are very limited. We would need at least, capability to do earthworks and possibility to build ways (rivers). I don't know how to do that. But, again, I'm not an expert on this. Maybe, Dwachs knows the correct answers here. 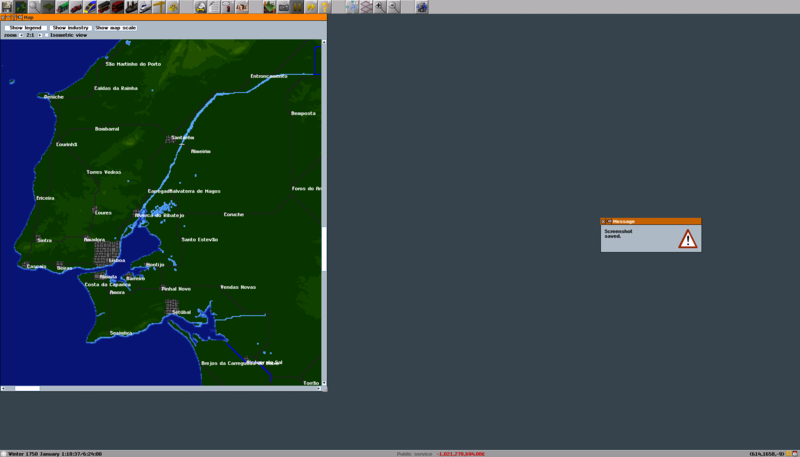 What I've done so far is to get the coordinates of rivers from OpenStreetMap data. The rivers are made of points, and from each point you get latitude and longitude. With a script, I change those coordinates to (x,y) coordinates in simutrans map. And with a script, I can get a marker to be placed in the game for each point. Then I remove the markers manually and replace them with rivers. It isn't as complicated as it may sound. I've done the three longest rivers and their tributaries so far. I'll try to do it in a separate post. But it isn't easy. It would be good to create a script that modifies the terrain and builds the rivers. To my knowledge, that isn't possible. You can see how this script modifies the terrain and builds a short stretch of road, I think you can do something similar here. Out of curiosity, where is this map based? 1) The coordinates I get for the river position aren't exact with the terrain. Sometimes I have to manually offset (plus or minus one tile) the placement of the river to fit in a valley, for example. 3) The algorithm used for building the river doesn't seem easy for me. Even to sort the points you get from OSM (not ordered) in downstream order is hard enough.